"No way! Titannica! Oh my God!" David Cross is as under-appreciated among mainstream American audiences as the TV series he in which he currently appears, Arrested Development. This semi-cult icon did his time on the stand-up circuit and has appeared in Men in Black, Scary Movie 2, and Eternal Sunshine of the Spotless Mind. His best work, however, was in HBO's comedy sketch program, Mr. Show. HBO had no idea what to do with this incredibly smart and witty show, constantly shuffling its time slot, and often banishing it to late hours. It survived from 1995 to 1998, and now that HBO has packaged all four previously released seasonal DVD sets together, perhaps a new legion of fans will emerge. Mr. Show is a two-man production, Cross and Bob Odenkirk. Odenkirk, with smarts similar to Cross and a ton of original ideas, has spent half of his career behind-the-scenes as a writer (Saturday Night Live, Late Night with Conan O'Brien) and the rest in films like Wayne's World 2 and The Cable Guy. He recently directed the acclaimed independent feature, Melvin Goes to Dinner, as his latest career turn seems to be headed again behind the camera. Mr. Show is not your parents' sketch comedy show, as each half hour delivers raw, cutting-edge humor. It always begins with Cross and Odenkirk addressing an audience in what appears to be an old theater/comedy club. They initially touch on a particular theme, then they're off on a comedic journey across various sketches; eventually making their way back to what was covered in the opening. This is a tricky, risky way to go about a comedy show, but it almost always works, keeping the suspense high as to what they'll dare to do next. Some of the most memorable recurring characters and skits include Ronnie Dobbs (played by Cross and also the subject of the underrated feature film, Run Ronnie Run). Ronnie has the dubious distinction of being the most arrested man in America, and from the very first episode we get a first hand look at what he's all about. The first season consists of only four episodes, but it doesn't get any better than Jack Black singing about what he wants to do to a hole in a wall. This has to be seen to be believed, an early glimpse at what Black's career would blossom into. Season Two has six installments, including Mr. Show becoming a sovereign nation and Cross' new English accent. One of the best bits here is a take on Jesus Christ Superstar called Jeepers Creepers Semi-Star. An outrageous few minutes, this piece has Jack Black again foreshadowing his Tenacious D and School of Rock days. Other performers also show up, many of whom would go on to more popular TV and movies, including Mary Lynn Rajskub (Chloe in 24), Jeanne Tripplehorn (The Firm), and SpongeBob SquarePants, himself, Tom Kenny. The third season wouldn't be the same without the funniest Ronnie Dobbs skit, Fuzz: The Musical, in which Ronnie is "discovered" by filmmaker Terry Twilstein, who turns him into a media darling, and produces a musical based on his life. Your comedic palette just isn't complete without hearing Ronnie sing a song that will stay in your head for days. A trippy version of Druggachusettes, is performed by the physically-challenged rock group, Indomitable Spirit, there's a visit to a sick kid by hair band Titanicca, and numerous riffs on religious extremism. The fourth and final season sees the end come with the boys at the top of their game and the series as fresh and original as when the first episode aired. Recurring characters continued to make appearances, but Odenkirk and Cross don't rely on such gimmicks for laughs. Instead, this season offers a mockery of blooper shows, a look at Taint Magazine, and the Marilyn Monster Fun-Ployees Training Video. A few years ago I made a road trip to Chicago to catch Mr. Show cast live, and it was incredible to see just how popular the act was, with the line to get in snaking around the theater. It was well worth the wait and the five-hour drive, as Cross and Odenkirk, along with much of the original cast brought many favorite characters and sketches to life, exhibiting just how timeless their comedy is. Image Transfer Review: All 30 episodes are presented in their original full-frame format, with the overall quality varying from season to season. Colors are slightly muted and there's a ton of grain and dirt, but the shows look just like they did on HBO, and that's really all that matters in this instance. Audio Transfer Review: The Dolby Digital 2.0 audio is nothing special either, but it also had original broadcast quality sound. Everything except audience laughter stays up front, but the key to the show is the dialogue, which is always as clear as possible. Before It Was a TV Show... - Early stage footage of Bob and David in action. Extras Review: While extra features vary from disc to disc, the one constant is a series of audio commentary tracks (30 total) that are among the best DVD has to offer. Multiple cast members show up throughout the different tracks, but Odenkirk and Cross are always on board, offering hilarious insights as well as pretty much anything else you can think of that has to do with today's pop culture, politics, religion, and so on, These guys talk as if they have no idea they are being recorded, and it's this natural comedy that makes these commentaries so listenable. The rest of the extras are almost as good, including The Best of Mr. Show on Disc 1 of The Complete First and Second Seasons portion of the boxed set. This nearly 25-minute piece contains footage from an actual vintage news broadcast with voiceovers by Odenkirk, Cross, and other Mr. Show cast members. The rest of the piece consists of footage from Mr. Show: The Complete Third Season. Fuzz: The Musical is also from The Complete Third Season, but is a six-minute slice of comedy that never gets old. This disc also has bios on Odenkirk and Cross, 10 TV spots, and Before It Was a TV Show... This is a great peek at the stage version of Mr. Show that preceded the TV series. 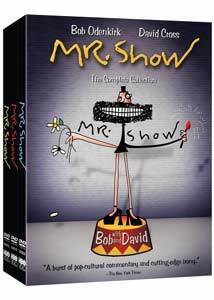 Disc 1 of Mr. Show: The Complete Third Season has more supplements, including Bob & David at the 1997 US Comedy Arts Festival, a collection of promos for the show and onstage footage from the festival. There's also an instrumental version of Druggachussettes by Eban Schletter that is even trippier, and eight TV spots. Disc 2 of this season includes The Best of Mr. Show: Fantastic Newness, which is similar to the aforementioned feature from the first disc. This lengthy collection of clips is from previous episodes, however, and are included in a mock infomercial called "Fantastic Newness." There's also Bob and David: Where Are They Now?, which is basically updated bios on the duo. Disc 2 of The Complete Fourth Season houses a blooper reel featuring outtakes from the first three seasons. This is a whopping 15 minutes and incredibly funny, consisting of profanity-laced tirades, and a bunch of footage that didn't make it into the finished product. The Naked Improv is a four-minute 1998 Comic Relief appearance by Odenkirk and Cross where they ask the audience to guess a phrase through improvisation. The Grand Reunion is a three-minute featurette showing the cast's commentary recording session, and Mr. Show Jukebox is 12 audio-only songs from the show. Rarely has there been funnier sketch comedy on television. Consistently pushing the boundaries of religion, politics, and sexuality via parodies, the brainchild of comedians Bob Odenkirk and David Cross didn't last on the air as long as it should have. HBO Home Video has packaged all four seasons together in Mr. Show: The Complete Collection. Unfortunately, there's nothing here that wasn't available in the earlier releases, but having everything in one box is a plus.